As of Season 6, Episode 8, I think Arya is at best a good fighter with a tougher exterior for lying about who she is in order to take on new identities and achieve her avenging goals. The journey to get to the Faceless Men over the past five seasons hasn’t been as mysterious, magical, or interesting as I think it could have been. Why is that? Who really is Jaqen? It’s a little vague. Is he really no one? It appears so. Is he just a face or personae all the Faceless Men have been using? Yes and chances are Arya has dealt with at least three Faceless Men in the series using his identity: One that was in Westeros that pointed her to Braavos; one that was in the House of Black and White that drank poison and one that switched from using the Waif’s face to Jaqen’s in Season 5, Episode 9. So I don’t think Jaqen had a plan all along from season to season for training and mentoring Arya. That could only happen if Jaqen was a person and he’s not. I think Arya has interacted with a lot of Faceless Men in her journey. Who really is the Waif? Is she a Faceless person too? It’s vague. When another Faceless man using Jaqen’s face drank the poison (S5E9), she either was the Waif in training taking on Jaqen’s face or it was another Faceless man who had been using the face of the Waif changing it to Jaqen’s. I tend to believe she’s a Faceless person in training. The Faces and the Hall of Faces: How come they have not deteriorated in quality over time? After all, they were someone’s faces before they were collected. Have they been transformed by some type of magic so they don’t deteriorate and also allow the users to change their body size and shape as well as hug naturally to their faces? If there is magic, why haven’t we seen Arya learn that or use it? The waif’s face Arya left in the House of Black and White didn’t look processed like others do. It was bloody, so I can only surmise she didn’t learn how to process faces to remove them properly for future wear. Perhaps learning how to use magic with faces requires some time? Also, a face appears to be a persona; not just a face. The wearer not only sounds like and has the appearance of that person, they also have their mannerisms. I theorize that they may also have the memories of anyone who has worn that face; including its original owner. If that is the case, where are all those memories stored? Perhaps the faces form a network themselves feeding experiences back to the collective conscience in the Hall of Faces like the Weirwood Trees of Westeros? Perhaps each faceless person learns to tap into that knowledge to achieve the stealth they are known for when they use a face? 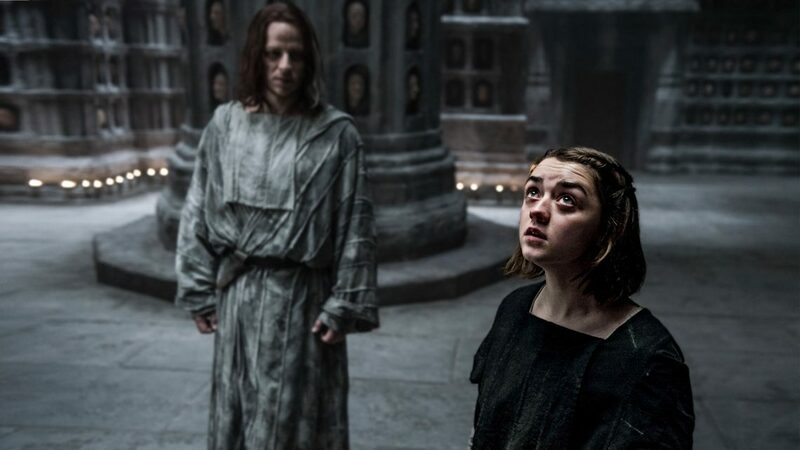 Jaqen’s goal with Arya: Was it to put Arya through the Faceless process to see if she could be Faceless for her own cause or to help her figure out who she truly is? I tend to believe they put Arya through the Faceless process; lives and deaths always have to balance each other as part of that. Arya gave a face that was owed so they are even and she could go free. Since she originally told them she wanted to be “no one,” they tested her to make sure she was “no one.” After she passed, she decided not to be one of them and they don’t seem to hold that against her. I don’t believe that has to do with any sort of past adventures or history with Jaqen, since she’s dealt with many faceless persons. The waif held things against Arya because she truly wasn’t a Faceless person yet. Arya’s goals: Did Arya put on an act saying she was “no one” just to learn how to fight better or learn how to wear faces? So she could plow through her list faster? I believe so. Somehow she learned to lie convincingly enough to avoid death from drinking the pilgrim’s water and regain her sight in the process. Rules for being a Faceless person: Do you have to be objective about who you kill? Do you have to be subtle with how you kill someone so you don’t get caught? Can you hold personal grudges against anyone or want to kill someone specifically? I think you do have to be objective and unemotional about killing because if you are “no one,” how could you hold a grudge? You don’t exist to anyone, right? Getting caught means death. Do you think Arya possesses any of the Faceless Men’s qualities besides changing her identity, lying and fighting? Will she improve the skills she has now? Can she actually wear faces? Remember Jaqen said only truly “no one” can wear faces. Share your thoughts below! I agree with fluids because jaqen did actually say that only no one can wear faces. Also the thoughts that he had were accurate and precise. This episode to night is going to be epic # which team are you on? If you have not watched S6E10 then please do not read these spoilers!! So it turns out Arya can wear faces. There’s possible inconsistency between leaving the Waif’s bloody face at the House of Black and White and wearing the cup bearer’s face that executed Walder Frey and his sons. Unless of course Arya took this face in exchange for the Waif’s at the House of Black and White. If Arya has the power to create a face then why was the Waif’s face left there bloody? Wouldn’t she have left it as cleanly displayed as all other faces in the House of Black White? I am having a hard time suspending my disbelief with her story-line. If she starts shape shifting on command then I will throw up my arms. For me this has been just sloppy story telling. It could have been a lot more mysterious and intriguing. Generally for me the kills have been empty although I do feel Caitlin, Talisa have been avenged (Ramsay took care of Rob’s killer.) I don’t feel Arya has the mystique I was hoping for her to have.